Mountain Shirt: Atlas Grey edition. Looks effortless at 5,000ft or back in civilisation. The Mountain Shirt looks back to a golden age when you simply climbed in the shirts you lived the rest of your life in – a time when men were made of granite and their clothes were made of cotton. We’ve combined the long-lost colours and zen-like simplicity of mid-20th century design with performance from the future, to completely rebuild the shirts that Earth’s mountain ranges were first scaled in. Using advanced Swiss technology, we’ve re-engineered cotton to make it as water-repellent and dirt resistant as a lightweight jacket, and as stretchy, fast-drying and high-wicking as a high-performance baselayer. With incredible engineering hidden beneath its radically stripped-down design, the Mountain Shirt looks at home whether you’re hanging out on a 1,000ft ledge, or out at dinner back in civilisation. We shot the Mountain Shirt on kitesurfer, speed-flyer and climber Murray Smith, who is 5ft 9 / 175cm and wearing size medium, along with our Ocean Shorts in Green. And on adventurer, climber, wingsuit pilot and base jumper Maxwell Roche, who is 6ft 1 / 185cm and also wearing size medium. The Mountain Shirt fits true to size and if you’ve already got our Planet Earth Shirt you’ll find this has a similar fit. 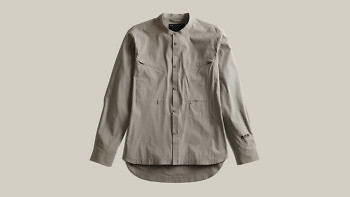 Like a great climber solving a problem in the most efficient way, the mountain shirt is built with zen-like minimalism. We removed the collar, made almost every element of the shirt one block colour, and put enough weight and material into the shirt to have it hold its shape. But despite its stripped-down appearance it comes equipped with angled zip pockets, carabiner loops, concealed air vents that work like air-con, an inside Velcro pocket and the performance of three tops in one. To build a shirt that can work in any mountain range on earth you need to start with an exceptional material, so we built our fabric from scratch in Switzerland with cutting edge fabric mill Schoeller. We blended a robust, heavy-weight cotton with elastane, to create a material that stretches with you in any direction while cooling and calming your skin in intense humidity. The fabric is also Blue Sign approved which means it’s produced with minimal impact on people and the environment. 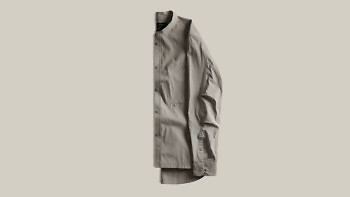 Every square centimetre of the Mountain Shirt is finished with Schoeller’s 3XDRY treatment. 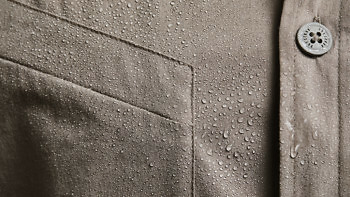 It makes the outside of the shirt water repellent, while making the inside of the shirt behave like a sponge – rapidly absorbing and spreading any sweat over a massive surface area so that it can evaporate at high speed to cool you. An antimicrobial treatment inhibits the growth of bacteria on the fabric to kill microorganisms that feed on heat, humidity and moisture. You’ll find hidden air vents in both armpits where you sweat the most. Designed for hot, humid or arid environments they work together like in-built air-con. Each vent is lined internally with a feather soft, lightweight Italian mesh fabric. The mesh is fast-drying and incredibly breathable which means sweat can escape easily and air can flow into your shirt to cool you rapidly. 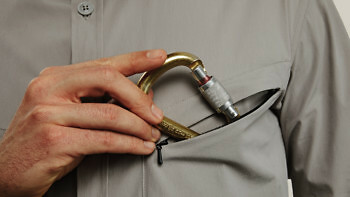 Both vents create extra flex in the shirt when you’re reaching for a hold, and are reinforced for strength. Vital kit falling out of your pockets is always a hassle, and if you’re hanging upside down like a bat on a rock it’s inevitable. 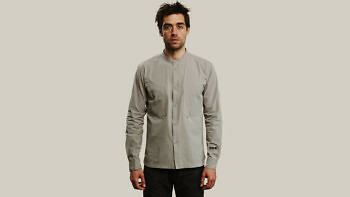 The Mountain Shirt comes with two zipped chest pockets that let you take more with you and keep hold of it. They’re deep enough to fit phone, keys, carabiners or energy bars. They’re angled upwards towards your shoulder so they’re easy to unzip with one hand if that’s all you have free. And the zippers are minimal and concealed. Cotton is a natural fibre, so won’t annoy your skin even on the longest and hottest day. It’s fast-drying so even if you’re sweating under a massive backpack it’ll disperse and disappear quickly. It’s made from the same highly robust material as our Planet Earth Shirt, so won’t snag the minute it comes up against rock. And because it stretches you can layer up comfortably under or over the shirt once you reach higher altitudes. The fabric and construction of the shirt come into their own in cold terrain. It’s soft, stretchy and high-wicking enough to be worn as a baselayer and prevent the build-up of sweat that can rapidly chill you. And with no collar it won’t add bulk around your neck. Or you can wear it over all your other layers as a field jacket as it’s engineered with 4-way stretch, zipped pockets and two carabiner attachment points. Designed as an alternative to climbing in a t shirt or baselayer, the Mountain Shirt gives you more options in the changeable mountain weather you get in summer. Buttoned up it acts like a baselayer. Once you roll the shirt’s sleeves they stay rolled as they’re engineered in the shape of a moving arm, and the material is weighty enough to hold its position. And if the sun starts baking you, instead of having to pull a top over your head mid-climb, you can simply unbutton the whole thing and let it hang open. 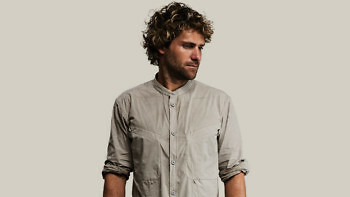 The Mountain Shirt adapts to life back in civilization as easily as it thrives in the mountains. Wherever you are in the world, you can wear the same shirt out to dinner that you’ve been climbing in all day and people will still think you’ve made an effort. 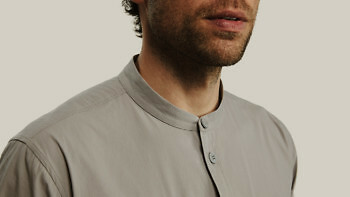 The air-vents and fast-drying anti-bacterial treatments mean that all signs of exertion will have disappeared, while the minimalist tailoring and subtle colours give you and your shirt an epic, timeless feel. Even after you’ve climbed all day and been out to dinner in the same shirt, you can throw it on the next day for the flight home and have a decent shot at being upgraded. The anti-bacterial treatment will help it stay smelling fresh. And whether it’s been screwed up in your pack, or neatly pressed, the shirt looks good. In crumpled or pristine condition the long sweeping bottom hem and zero collar make you look like a zen-master ready for the journey home. Black Light Jacket. The world’s first all-black night visibility gear.